Going over what Pili is going to say to Sarah to they and get Godfrey on the block. Ashleigh adds some key points to cover, like Godfrey wants to keep Zach in the game because once Zach is gone Godfrey the last guy and will be the target of all the girls. Pili is also going to tell Sarah that she’s a vote to split Zach and Ashleigh. Pili’s bit starts with her hearing Godfrey and Zach talking last night and she think’s Zach has Godfrey’s vote. She is going to stress Zach/Ash are going final 2, Pili needs to split them up. The the only way to guarantee Zach goes is for them to put Godfrey up and she’ll vote out Zach. Godfrey & Ashleigh got to see family members in person for their PIZZA PIZZA reward! 3:45pm The feeds return to Ashleigh explaining to all the other house guests that she opened the door and her mother was there. She got to talk to her. Godfrey says that his sister is pregnant. She says she just stood there and hugged her forever. Godfrey says that he thought he was going to get a movie or some cash. He tells Ash good thing you were good at tasting all that food yo! Sarah says wow that is so amazing! Pili asks what about your sister god?! He says that he didn’t know what to expect when he saw her sister in the backyard. 11:40am HOH room. Brittnee talks to Sarah in the HOH while she brings her new batteries. Sarah says we don’t have to trust God it doesn’t matter. Brittnee is definitely going to vote Zach out. Do you trust Ashleigh? If I put you up on the block and you go home this week its not my fault its, Ashleighs fault. Brittnee says because I am voting to send Zach home. It breaks my heart.. Sarah says but thats how I am going to vote too. We’ve been saying its best for our game and its what we have to do. Brittnee says honestly it is what it is otherwise he is going to take it. 1:30pm Up in the HOH room – Sarah tells Godfrey the odds are in our favor. Just be confident and calm. Godfrey says yeah I will. 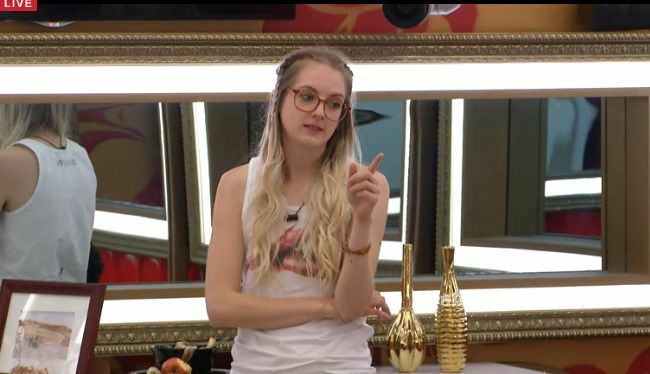 Sarah “I said I would put you (Godfrey) up if they won but there’s no way I would do that!” Godfrey says if its physical then hopefully Zach can win it and pull himself off. Brittnee and Sarah say that’s not ideal … what the f**K god!?! If its physical you’re going to try and pull it off. Gdofrey says I’m just saying I would rather him than her win it. Sarah says even you want to keep this dude around!! 11:20am When the feeds return – Sarah and Brittnee are in the HOH room talking. Brittnee says I think that she would get rid of Zach. Like I hope this week goes okay. I hope that you, me or Godfrey win veto. Sarah says or Ashleigh. Britt says yeah and then Pili would go up. Brittnee says you did a great job I know its not easy. Sarah says it’s not, although she just did it to me. She would do anything to protect Zach even though its not in her best interest. I don’t think they liked the king thing. Brittnee says you told her she was going up. Zach joins them.. says if he wins the POV Ashleigh goes home, if Ash wins it Zach goes home if Pili wins it they all stay and God goes home. 6:25pm The live feeds return with Sarah and Brittnee competing in the Pizza Pizza task!! Sarah and Brittnee are tied together with a large apron. The task is for them to try pizza’s and then pick out the ingredients on those pizzas. Sarah and Britt make their choices and and tell Big Brother that they’re locking in their answers. Big Brother tells them to head up to the board and celebrate locking in their answers. Sarah and Britt go up to the front to be filmed locking in their answers. 11:30am UP in the HOH room. Sarah says I told Godfrey he needs to win it. Maybe now we’ll see him finally win something. Britt says hopefully he doesn’t win it and pull Zach off. Sarah says he wouldn’t, he’s wanted him gone. Brittnee says that was Bruno’s logic. If Godfrey won and took Zach down .. you would put up Pili right? Sarah says yeah. Britt says and you would want Ash gone then? Sarah says good. Either way one of them are going. Sarah says if Pili wins and pulls Ash down .. we would have to put up Godfrey .. and then the girls choose to send Godfrey home. 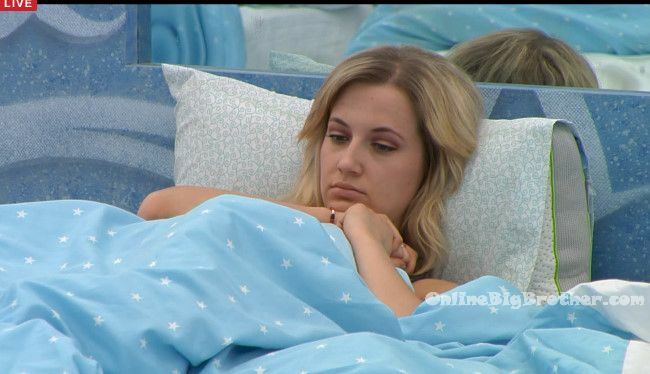 Britt says I am going to fight hard for it to keep the noms the same. 5:30am Big Brother wakes up the house guests. Up in the HOH room – Brittnee joins Sarah, Pili and Ashleigh in the HOH bed. Pili, Ashleigh and Godfrey are sleeping in the bed next to them. Brittnee tells Sarah about her conversation with Zach last night about going from top dog to bottom bunk. Big Brother calls Brittnee to the diary room. When she comes out the head to the kitchen. Sarah comments on how the living room tv doesn’t say nominations. Brittnee says it could still be later. Sarah is wondering why nobody wants to hang out in her HOH. Sarah is going to site the three diapers down and tell them she’s putting Ashleigh and Zach up because there is no wiggle room. Sarah adds that Ashleigh put her up with the intention of her going home. Sarah is not going to say that she’s putting Pili up as the replacement. Brittnee wants them to think Godfrey is the replacement. They realize two of them are going up this week. They mention that Godfrey was fighting to keep Bruno during the eviction.